Abstract. Pressure on land resources is expected to increase as global population continues to climb and the world becomes more affluent, swelling the demand for food. Changing climate may exert additional pressures on natural lands as present-day productive regions may shift, or soil quality may degrade, and the recent rise in demand for biofuels increases competition with edible crops for arable land. 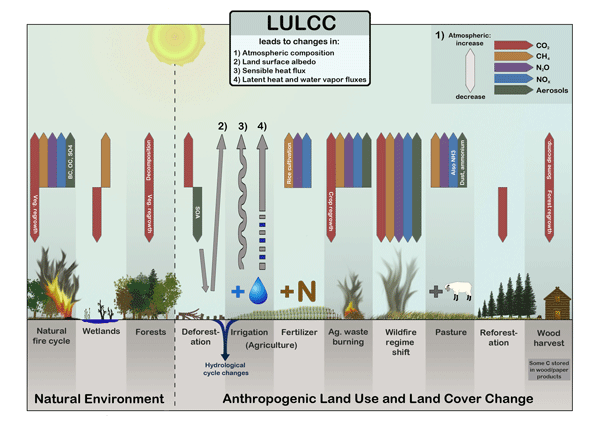 Given these projected trends there is a need to understand the global climate impacts of land use and land cover change (LULCC). Here we quantify the climate impacts of global LULCC in terms of modifications to the balance between incoming and outgoing radiation at the top of the atmosphere (radiative forcing, RF) that are caused by changes in long-lived and short-lived greenhouse gas concentrations, aerosol effects, and land surface albedo. 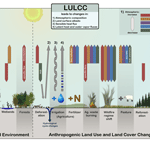 We attribute historical changes in terrestrial carbon storage, global fire emissions, secondary organic aerosol emissions, and surface albedo to LULCC using simulations with the Community Land Model version 3.5. These LULCC emissions are combined with estimates of agricultural emissions of important trace gases and mineral dust in two sets of Community Atmosphere Model simulations to calculate the RF of changes in atmospheric chemistry and aerosol concentrations attributed to LULCC. With all forcing agents considered together, we show that 40% (±16%) of the present-day anthropogenic RF can be attributed to LULCC. Changes in the emission of non-CO2 greenhouse gases and aerosols from LULCC enhance the total LULCC RF by a factor of 2 to 3 with respect to the LULCC RF from CO2 alone. This enhancement factor also applies to projected LULCC RF, which we compute for four future scenarios associated with the Representative Concentration Pathways. We attribute total RFs between 0.9 and 1.9 W m−2 to LULCC for the year 2100 (relative to a pre-industrial state). To place an upper bound on the potential of LULCC to alter the global radiation budget, we include a fifth scenario in which all arable land is cultivated by 2100. This theoretical extreme case leads to a LULCC RF of 3.9 W m−2 (±0.9 W m−2), suggesting that not only energy policy but also land policy is necessary to minimize future increases in RF and associated climate changes. How to cite: Ward, D. S., Mahowald, N. M., and Kloster, S.: Potential climate forcing of land use and land cover change, Atmos. Chem. Phys., 14, 12701-12724, https://doi.org/10.5194/acp-14-12701-2014, 2014.